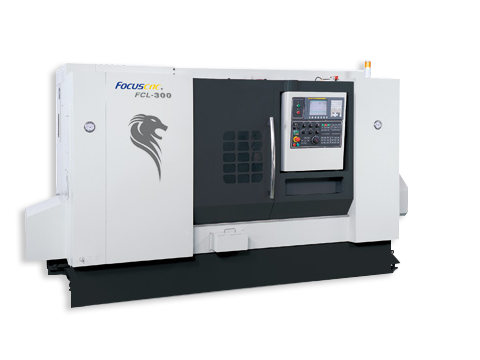 FCL-300MC Powerful Milling and Turning System Adopts the latest tool selection systems, the fastest servo turret, 3-disc clutch gear positioning and fast hydraulic locking. Tool-to-tool change 0.2 second. Powerful drilling, milling, turning, tapping as well as end milling capabilities for high efficiency integrated machining. FCL-300/P High Speed and High Precision Hydraulic Cam Turret Holds 10 tools, 0.3 second tool change, repeatable accuracy up to 0.002mm. FCL-300P High Precision Spindle System Front and rear end of spindle uses high rigidity 2-column NN type ball bearings. Middle section spindle with ø130mm large diameter, high precision angular ball bearings for heavy duty machining at low speed. FCL-300MC HighAccurate CS Indexing Spindle System High accuracy CS indexing spindle driven by CS high accuracy servo motor, high resolution feedback device. Chuck size inch 10" 10"